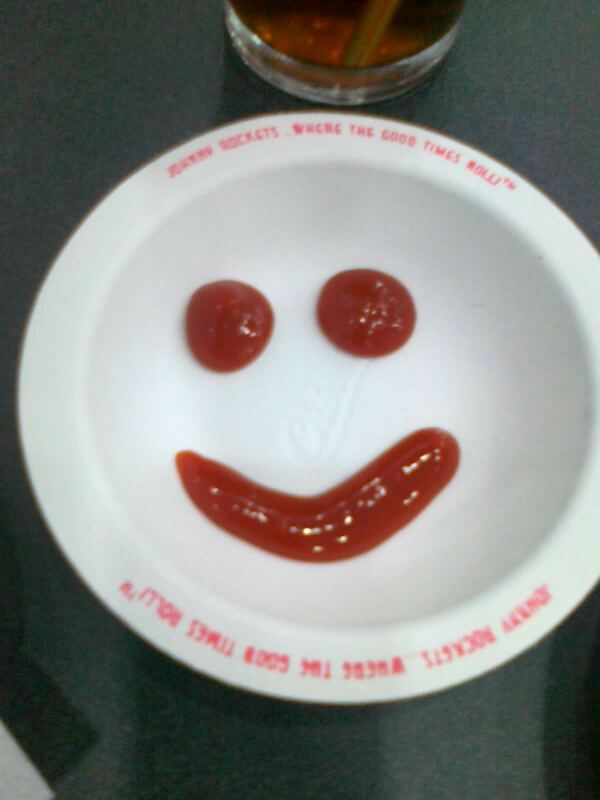 Earlier tonight, Beloved and I ate at Johnny Rockets. This burger place has been a “want to go but I know for sure this is gonna be an expensive place” kind of resto in my list. Heck, I’ve never gotten the opportunity to see the menu even though there’s a Johnny Rockets at Eastwood and practically all other restaurants provide prices for their food outside to lure you in. Just that is a sign that this is gonna be an expensive place. What made this a “want to go” place was, aside from being a burger joint and me being a burger aficionado, the fact that they serve eat all you can fries—another food item I can practically fill my belly with. Anyway, another branch opened up at Tomas Morato just recently. For some reason, Beloved and I took earlier tonight the opportunity to try it out. As expected, their menu is filled with burgers. I was also overjoyed with the fact that all their burger items come with said all you can eat fries. They boast that their patties were 1⁄3 pound ones, and they do have quite a few selections varying in different toppings. 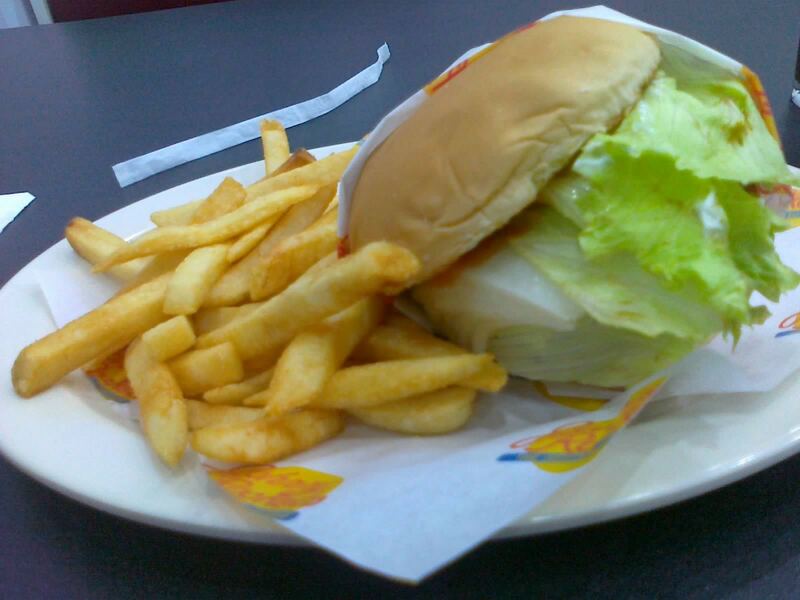 The downside is their cheapest burger and fries combo is a little less than 300 Php. That was expected by me, anyway. After a hard time deciding, I just went for their Rocket Single (345 Php), and Beloved had their #12 (335 Php). Our drinks cost a whopping 110 Php each for Lemonade and Iced Tea. They’re refillable, though. My father once said to me that this place has the best shakes and malts, but seeing as they’re priced almost as expensively as our food, we decided to pass on that. After a dance routine from the servers that happens throughout our stay, maybe every three or four songs, our orders arrived. My Rocket Single was basically a cheeseburger. It had cheese, tomatoes, onions, and their special sauce. I like how the burger was cooked. 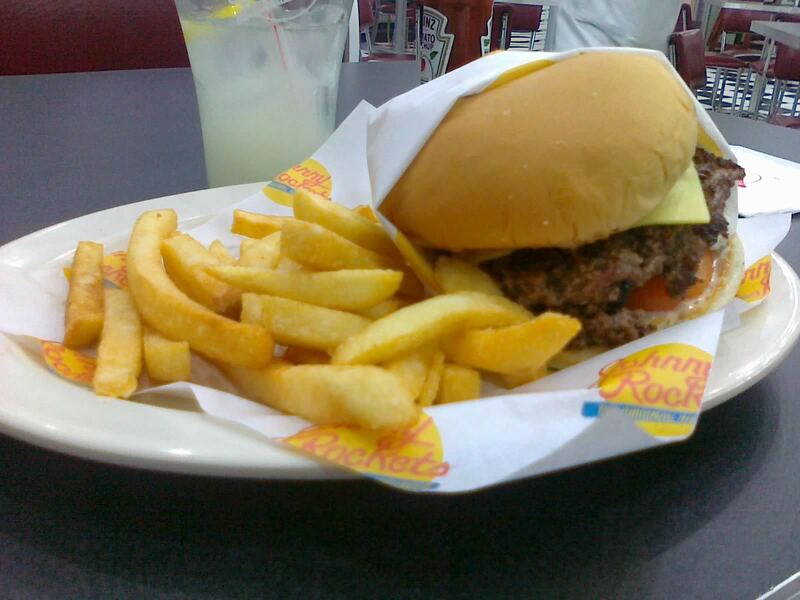 It had a crispy crust and all the juicy goodness of the meat still trapped inside the patty. The buns deserve a special mention as well, for being very soft and a bit on the sweet side. I’ll also mention that the onions they used were an entire cross section of an onion, and not just a couple of rings. The fries were of generous cuts and were soft and fluffy on the inside. The outside could’ve used more crunch, but that’s just my preference. They’re pretty bland, but that’s why they give you an entire bottle of Heinz and have salt and pepper on the table. What’s great is the servers periodically ask if you want more. I barely managed a couple of servings. Beloved’s #12 was similar to mine. Differences include more lettuce, making it crunchier, and a red tomato-based sauce, which made the sandwich a bit on the tarty side. Beloved was the one taking the photo, making it look like it had a lot of greens. Don’t be fooled!—there’s a similar 1⁄3 pound burger inside that bun. As I’ve said, I got full after a couple of servings of their fries. But does that justify the almost 1000 Php price tag? Honestly, this wasn’t the biggest burger I’ve had in the Metro (for those asking me, the review of that place has yet to come). Taste-wise, this might be among the top. Value-wise, this belongs to the bottom; maybe on top of the fail “wagyu” burger I had before. Nevertheless, I’m giving this store a thumbs up just because of the experience—I guess you also pay for the dancing staff. While unlimited fries try to justify the price tag, unless you’re a french fries connoisseur like me, you probably won’t be able to eat 500 Php worth of fries in one sitting. Still, again, this store warrants a “worth a try”, with much stress on the “a”, from me. Maybe just once in your life. For the experience, of course. Oh, and make sure you have at least one purple colored bill in your wallet, just in case. Recommended for: French fries lovers; rich burger lovers. Not recommended for: Budget eaters. Smart nomnomnom tip: Don’t be alarmed if the staff starts dancing to YMCA.